Home > Hairstyles > What Haircut Should I Get? 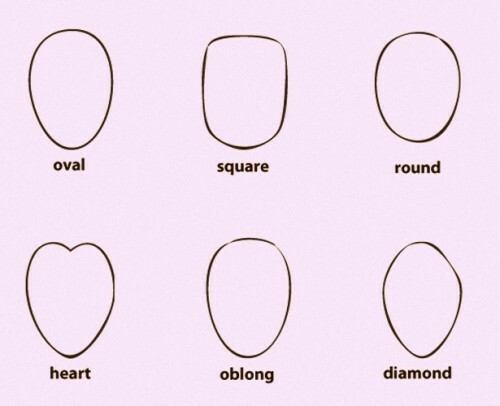 Every woman has a unique and distinctive face, but its general shape will fall under one of the following categories: oval, square, round, heart, oblong and diamond. Knowing your facial shape will help you determine the most flattering haircut to complement your natural beauty! By picking the right haircut, you can enhance your best features and minimize your least favorite. In this article, we will show you the best haircuts for you and help you understand why. To figure out which facial shape matches you, pull your hair back into a ponytail and look into a mirror. Then check out our descriptions below. Keep in mind that sometimes, your particular bone structure might incorporate traits from two or more of them. Oval face shapes are considered ideal because they are well balanced and proportionate. They don’t have any hard angles but aren’t totally rounded. Because of this, generally any haircut looks great on them. An oval face will be widest at its cheekbones, but only slightly. It narrows nearly equally at the forehead and jawline. This gives the face a universally flattering look that can be complemented by many different haircuts, because it doesn’t require the hairstyle to balance its shape. A square face is one of the most common facial shapes. The face will not appear to change in width from the jaw to the cheekbones or the cheekbones to the forehead. The main characteristic that a person with a square face will have is an angular jaw, or sharply squared edges around the forehead. Generally, square-faced people will want to steer clear of geometric or blunt haircuts. Any haircut that can soften the face is a great look. Round faces are pretty self-explanatory. Their widest point is at the cheekbones, but unlike an oval or oblong facial shape, they are shorter in length. They do not have any prominent angles within their facial structure. The best hairstyles to suit this shape are ones that add height to the crown and avoid adding volume on the sides. The heart facial shape is also known as the inverted triangle. It’s characterized by the widest point being at the forehead and the narrowest point at the jawline. It can be rounded or angular around the edges. Ideally, the haircut a person with a heart shaped face would get would add volume around the chin. They should typically avoid blunt bangs because they create the illusion of a shorter face and can make the forehead look even wider. Oblong faces are similar to square faces, but they are longer like a rectangle. They tend to be the same width from the jaw to the forehead. Usually, they have sharp angles, but it’s not uncommon for them to be rounded as well. Full or textured styles with bangs can soften the face and balance out the width, but this facial shape would want to avoid center parts or flat styles that emphasis the length. A diamond shaped face is the most uncommon facial shape. The cheekbones are typically high and are the widest point of this shape. 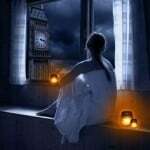 The forehead and the chin narrow considerably creating the diamond like shape. The best haircuts for faces like these are ones that add volume above the cheekbones or below them to create balance. Continue reading to see the top celebrity hairstyles for each facial shape! Rachel McAdams looks amazing in this trendy top knot hairdo. Because she has an oval shaped face, she can get away with pretty much anything because this face shape doesn’t need anything to balance itself out. By sweeping the hair away from the face, you can let your haircut accentuate your face without feeling the need to offset another facial feature. This long layered haircut, that Amber Heard looks lovely in, is great for people with oval faces because the layers frame the face nicely. You can style this with volume from roots to ends and a center part for a classic and stylish hairstyle that accentuates the symmetry of an oval shaped face. Blake Lively looks radiant with a long and flowing fishtail braid. Haircuts that leave the hair long are a great option for oval shaped faces because you don’t have to worry about the length of the hair making your face appear even longer. Then you can style it in something similar to this. With the hair slicked back and away from the face, you can show off your natural beauty! This glamorous and feminine haircut is perfect for someone with a square face like Diane Kruger. The side part allows her hair to fall over some of the angles of her forehead and jaw. The large ringlet curls add soft rounded lines that counteract the squared off edges these facial shapes tend to have. Taraji P. Henson has an absolutely fantastic haircut for a woman with a square shaped face. 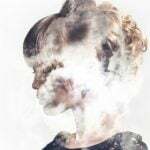 Keeping the hair side parted with side swept bangs changes the visible shape of the face by obscuring any square angles in the forehead and making it appear to be more rounded. Curls are always great for square faces because the waves complement the square shape really nicely. Another great feature of this haircut is the overall shape. The bob falling just above the shoulders is very flattering on almost every facial shape and the layers tapering down creates a round outline. Emily Deschanel is a great example to show what haircuts look good for square faces because her facial shape is extremely angular. A haircut that falls right around the shoulders is a beautifully flattering look for everyone. A side part offsets a square forehead and the long angled bangs round out the shape creating more of an oval. Adding face framing layers that curve inward creates softer lines that make the jawline look narrower. Mila Kunis proves that hairstyling is what makes a haircut great. Round faces tend to be short and wide with hardly any angles. To create the illusion of a longer face, you need to add height. You can do this with a short haircut or just by styling your hair. Tease volume into the top section of the hair while keeping the sides smooth. This lengthens the face without making it look wider. 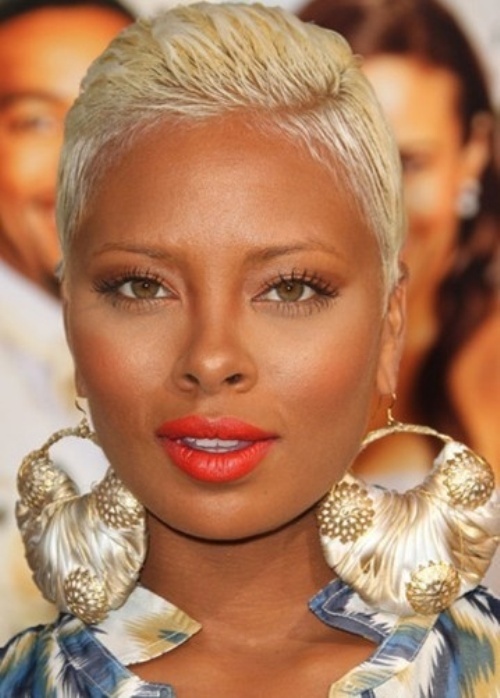 Eva Marcille looks gorgeous with this extra short haircut. Round faces can be less defined and therefore look girlish so a mature hairdo like this is a fantastic choice. By keeping the sides cropped tightly, with a little more length on top, you can add volume which in turn adds length to your face. The crew cut style haircut also creates an angled shape which contrasts wonderfully with a round face. 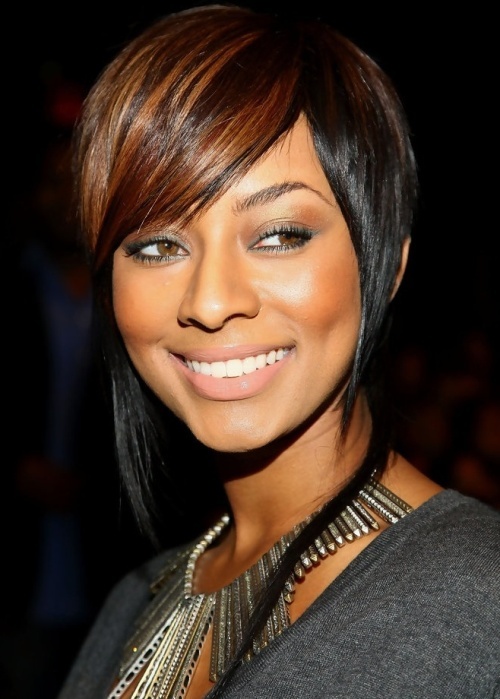 Keri Hilson is rocking one of the best haircuts for a woman with a round shaped face. The edgy, tapered bangs break up the roundness of the face and create different angles. By keeping longer pieces of hair around the face that fall below the chin, you can add length. The purposeful unevenness of this long pixie haircut is trendy and very flattering for a round facial shape. Lily Cole looks gorgeous with this long layered, curly haircut. It’s a great choice for someone with a heart shaped face because it adds volume below the cheekbones to help a narrow chin look proportionate to the rest of the face. The side parting obscures part of her forehead and makes it look less wide. Try having layers cut around your chin for the most flattering look. This is one of the best haircuts for a woman with a heart shaped face and Reese Witherspoon looks fantastic. It’s a long haircut, but there are face framing layers that add volume around the jawline and can help make a narrow chin unnoticeable. Keeping gentle waves in the lower half of the hair softens any sharp edges. The side-swept, slightly angled bangs that graze the eyebrow are a perfect addition to this haircut to mask a wider forehead. Ginnifer Goodwin looks amazing with this short haircut that’s ideal for heart shaped faces. The haircut is ultra-layered and texturized. The bangs conceal the large foreheads typically associated with heart shaped facial structures. Have them point cut to keep them edgy and jagged instead of blunt cut. Use a little bit of product for an effortless tousled hairdo! Liv Tyler is a gorgeous example of a woman with an oblong face. She is also donning a beautifully flattering haircut for this type of facial shape. Long blunt cut bangs shorten the face which is a perfect way to make an oblong face appear to be an oval face since they are so similar naturally. Sarah Jessica Parker looks like a glamour goddess with her voluminous locks. This is a great haircut for oblong faces because the hair adds a ton of volume to the sides of the face. This makes the face appear to be less long and narrow. Usually, a long haircut can make an oblong face look even longer, however, with these voluptuous curls it has the opposite effect. Tyra Banks has a great example of another attractive hairstyle for oblong faces. Her ponytail has a ton of volume which complements a long face wonderfully. Also, by teasing the hair out at the sides of the head, you add width to the outline of the haircut which in turn adds width to the face. This is a great way to use hairstyling to your advantage when choosing the right haircut for you. Naomi Campbell creates a chic and sophisticated style with an attractive haircut that’s great for women with diamond shaped faces. The blunt cut bangs make a narrow forehead go unnoticed. Also, the bangs combined with her sleek bobbed haircut frames perfectly the high cheekbones characteristic of diamond shaped faces. Keeping your haircut straight can keep the diamond shape from looking too dramatic. Rihanna looks beautiful with this flattering short haircut for diamond shaped faces. Having the ends of the hair fall around the jawline ensures that it won’t make your face look too long and also that the facial structure at the cheeks will not look too wide. Long tapered bangs that fall below the cheekbones accentuate their height, but don’t allow them to dominate her face. Rebecca Romijn showcases one of the best haircuts for a diamond shaped face. The long, angled bangs graze the cheekbones and soften their edges, complementing them perfectly. Have your hair cut at your chin and style it so that the ends flip out between the cheeks and the chin. This adds the illusion of width and makes the transition from the high and wide cheekbones to the narrow chin much easier. 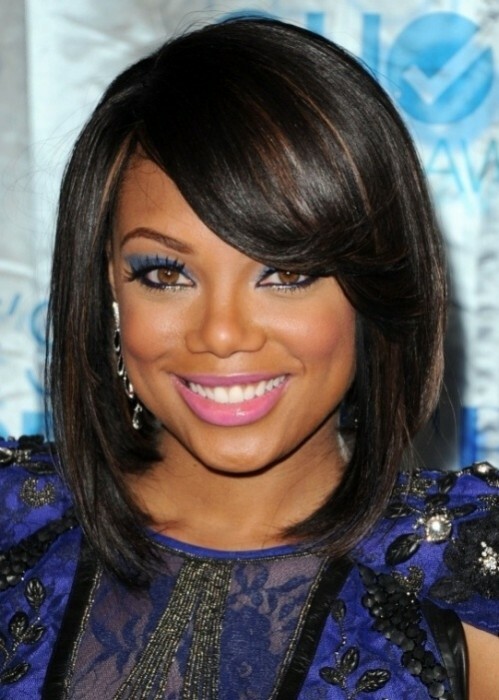 Tiffany Hines looks absolutely divine with this bob haircut. This particular haircut is considered the universal cut because it’s so flattering for every facial shape. The hair grazing the top of the shoulders doesn’t create too much length to the face or too much width. The side part looks great on everyone and side-swept bangs complement many different facial structures. Emma Watson’s curly bob is a feminine and pretty haircut for everyone. The soft curls and angled bangs flatter every facial shape when the hair is around shoulder length. Blake Lively’s haircut is so universally flattering that every facial shape will look attractive with their hair cut like this. It’s a long layered haircut with just the right amount of volume and texture to complement a variety of facial features. Amber Heard’s vintage glamour waves look divine and can flatter all six of the facial shapes woman have. The haircut is timeless and classic which always looks appealing. The combination of the waves, volume and length would be a perfect fit for anyone. Megan Fox looks gorgeous with this long version of the ultimate universal haircut. The side part and long side-swept bangs look pretty with any bone structure, while her medium length curls flatter with their ratio of volume to length. This is a great way to style any haircut that’s long enough to make it universally flattering for any face shape. The low bun and long side parted bangs are both feminine and attractive.